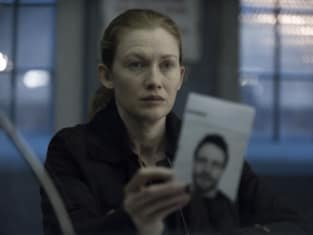 Perhaps it's past experiences or the general knowledge to recognize that most television shows are filled with twists, but watching The Killing Season 3 you can't help but try and guess the murderer at the same time you're wondering who the show will be trying to trick viewers into believing is the killer. And yet, as the episodes continue, Linden and Holder's conclusions on which direction to take or which person to suspect and interview have felt logical. Bringing Goldie in because of his connection to Bullet and the videos or Joe Mills because of his connection to the motel and the voice on the videos made perfect sense. But are they the grand finale killer that's being hunted? Probably not. Even Holder admitted that in "Eminent Domain" with respects to Mills. They know something is not right with the guy, made more evident by the fact he's hooking up with Kallie's mom and he happened to have Kallie's phone. Yet there's nothing overly positive saying he's the real killer. And it's great to see both Linden and Holder work the case like the intelligent detectives they are, really trying to dig into the clues and the leads. While I know their boss, James Skinner, tells Linden to take a step back and not be so impassioned and close to the case, it's that type of attitude that's enjoyable to watch. This was an episode where Linden really got to shine through the dreary mess of a world and express her heated emotions and sometimes overly determined drive for finding the killer. Her character has always been rather quiet, leaving Holder to take up most of the time being lead Chatty Cathy while she spends her time observing and deducing from a distance. Except this new version of Linden, one whose child is no longer around (and a fact brought up when Kallie's mom tried to tell Linden she knew nothing of being a single mom), is not going to stop until she figures it all out. Watching her press one of the victims for a suspect ID, slamming her hands down at Skinner telling her she's got nothing, even coming up with jokes for Reddick, are just pieces of Linden on a mission. Even watching her lie on the ground to try and get the view of the killer from the closet while staring at the stars was both eerie, but a great transition towards a new lead. At the same time, Linden finally admitted to Seward that she knows he's not the killer. It was a great scene between the two, who both really expressed emotion over the situations in which they've been placed. In a lot of ways, there's something of a redemptive desire from both sides. Seward, who has been pretty much the crazed hard character that we've come to fear, felt far more open during the hour. And it was pretty easy to understand his frustration and anger over Linden admitting he wasn't the killer only three years later. On top of that, letting his inmate friend hang himself, while quietly talking to him as he did, was like he was trying to convince himself that it would be okay when it was his turn. You could really see it in his eyes and the shots of him watching enhanced the drama of the scene. It was also great to finally see Seward's father, who he despised so much. Clearly, it wasn't a Brady Bunch family reunion. That said, it was obvious why Seward held so much resentment as a son and possibly as a father... but it was an interesting turn to hear the father say he was proud. Granted, at this point, it's probably not going to be a help, but it was a big step for Seward to even bother to see the man. Really, it's those moments between the characters that not only allows them to stand out, but the performances themselves help make the people on the show interesting and fascinating to watch. And I'm glad that Holder kept on his hoodie. It's his signature outfit much like Superman in his cape and tights. Sure, the guy nails it no matter what outfit he dons, but it's a great classic look for the character. That said, the case continues to be riveting with each dark turn or discovery made. I'm not surprised that Adrain Seward knows the real killer, but it looks Linden and Holder are going to have to find another way to figure it out. So, is it maybe the minister? He seems even more plausible with the photos on the wall, the so-called shepherd of the shelter for the lost girls, and he's certainly got the religious connotations to match the new theory. But what happened to Becker? There's still something going on with him as well. Thankfully, nothing feels so obvious yet, and it's fantastic that we can travel on this twisted road of compelling characters and case. The Killing's return to television is continuing to shape up nicely.